The plans will be on display at various locations in the town until 19th November. The proposed Ilkeston station will connect the town to Northern Rail's Sheffield to Nottingham route. The station, which could open next summer if it is approved, will have two platforms and a new bus stop. 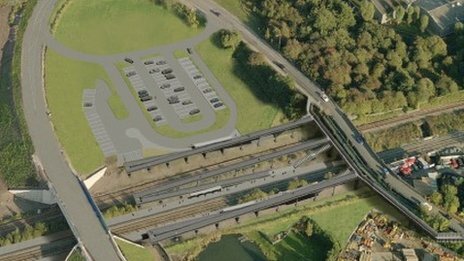 It is hoped the station could provide a jobs boost for the area. The government has agreed to provide £4.5m of funding, and Derbyshire County Council will contribute £1m.The Nottingham Housing Market Area Joint Advisory Board, which is a committee of local authorities in the region, will also put in £1m. Its role is to co-ordinate land use in the greater Nottingham area. Councillor Andy Botham, cabinet member for jobs, economy and transport for Derbyshire County Council, said the station could help to develop the area. "Ilkeston is the largest town in the country with a rail line running through it without a station," he said. "I want people to support the plans and once the station is built and up and running, to use it. We're turning a corner now and this is the second time in this county that we are actually increasing rail travel." Ilkeston once had three railway stations but lost the last one in 1967 after it was axed in the Beeching era cuts. The new station would be built near the site of the town's last station on land between Coronation Road and Millership Way. Campaigners in Ilkeston who have been pushing for a railway station in their town, believe the development would bring jobs to the area. Broxtowe Borough Council and Erewash Borough Council will consider the proposals in the coming months.